We assign to your project developers with the best matching skill set and control the quality at all stages. You can communicate with team through project manager or directly (if you work with a dedicated developer/team). Our R&D team is working with project teams to come up with the best solutions, practices and approaches, the experience of already done projects works for your benefit. 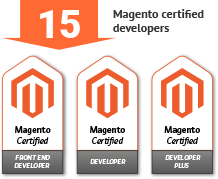 We can be your Magento programmers, please contact us for more details!